Ali Soufan, president of the Soufan Group, an international security firm, was for years one of the FBI’s chief experts on al-Qaida and two of its traditional power bases, Yemen and Saudi Arabia. On Thursday, after Houthi rebels forced the resignation of Yemen’s president, Abed Rabbo Mansour Hadi, a close U.S. ally, and Saudi King Abdullah ibn Abdulaziz died, Soufan spoke to Yahoo News’ Michael Isikoff about the mounting chaos in the region and how it could further strengthen al-Qaida. Yahoo News: What does Abdullah ibn Abdulaziz’s death mean for Saudi Arabia? Ali Soufan: This could not have happened at a worse time. The Saudis have to put in a succession plan to transfer power from the second to the third generation, and you don’t have a unified family. And there is going to be a lot of palace intrigue going on. At the same time, you have a crisis in the region: a crisis in Yemen, a war in Syria and Iraq. A threat of terrorism — remember, a big percentage of the suicide bombers used by ISIS are Saudis. The House of Saud has showed a lot of resilience over the years. But this is a crossroads for them. We’re in uncharted waters. Will the enemies of Saudi Arabia be able to exploit this? The Saudis know they are surrounded by terrorist groups that would like to create chaos and havoc inside the kingdom. It’s no accident that the day after the Saudis sent a team to look into opening up their embassy in Baghdad, ISIS attacked the border and killed a commander of the border guard. That gives you an idea of what is happening in the region. … If we don’t have a smooth transition, the extremists will take advantage. Regional foes might be encouraged to meddle. For example, the eastern district of Saudi Arabia — where most of the oil comes from — is populated by Shia who believe they have been oppressed. Iran might make a move, just like it did with the Houthis in Yemen. Right now, who is in charge in Yemen? As of today, there is nobody in charge. The Houthis are in control of the capital and areas up north. Ali Abdullah Saleh, the former president, is still very powerful —in the military and within the security services. And that’s why we see the military standing on the sideline. At this point, the only people who can benefit is AQAP [al-Qaida in the Arabian Peninsula]. They are Zaydi Muslims, a branch of Shia Islam. They feel they haven’t been full partners in Yemen. They feel a threat to their culture and their religious practices. The reality is, Abdul Malik al-Houthi [their leader] is being used as a proxy by Iran to establish a foothold in the Arabian Peninsula. For political purposes. Like they [the Iranians] have Hezbollah in Lebanon. Like they have [allies in] the Iraqi government — people who are loyal to them. Are [the Houthis] people the United States can deal with? Well, let’s put it this way. The slogan of the Houthis — one that they write on all their flags — is “Death to America, death to Israel and curses on the Jews.” And I’m not making that up. Now how serious they are about this, I don’t know. But we have to take them at their word, I guess. Yes, they are enemies of al-Qaida, AQAP. But in this case, the enemy of your enemy is not necessarily a friend. AQAP is our main enemy — it’s been the target of repeated drone strikes by the U.S. How will it be able to take advantage of something like this? Anytime we have a vacuum, any time we have chaos, AQAP and other terrorist groups thrive. 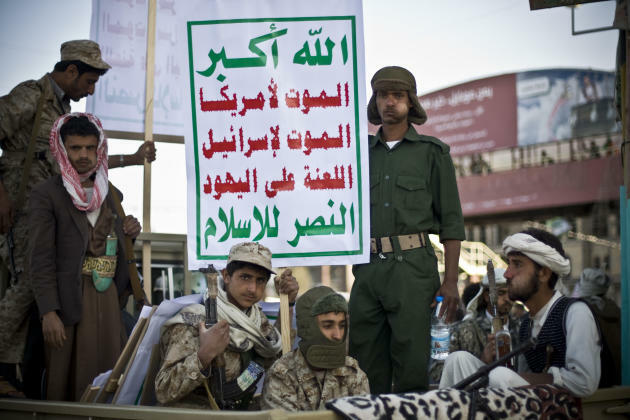 The conflict in Yemen is heading toward some kind of sectarian conflict. AQAP is presenting themselves regionally and locally as the defenders of Sunni Islam. We’ve seen that with IS in Iraq. We’ve seen that with al-Nusra and IS in Syria. I think AQAP now has the potential to control [more] areas. So after years of U.S. drone strikes, is AQAP weaker today or stronger? The drone strikes were not designed to degrade and destroy AQAP. They were designed as a tactical tool to get rid of imminent threats. So AQAP as an organization throughout the years became embedded in the culture of tribal areas in Yemen. I believe in some areas, AQAP is way stronger than they used to be a few years ago. What does this mean for U.S. policy? AQAP is AQ’s best affiliate. It’s been acting not only as an affiliate but as the official representative of al-Qaida. It is the entity that continues to carry on the global jihad of Osama bin Laden. And recently, they claimed they were behind the Charlie Hebdo attack. … Chaos in Yemen is going to affect everyone. It’s not only about regional security, it’s also about international security, global security. It sounds like a total mess. It is a total mess. Anybody who can tell you they know what’s happening in Yemen and what’s going to happen in Yemen, I know one thing: They don’t know Yemen.